My headlight flashers have never worked. I've done lots of electrical work on the Land Rover, but I hate removing the steering column shroud. The first time I tried to remove it was on one of the expedition Defenders in Belize and was greated by a puff of smoke as something shorted. I was then doomed to perpetual fuse blowing in the next few months. Until now, I've been scared off from pulling it apart, but with the rain settling in after two weeks of sunshine I turned my attention to the inside and plucked up the courage to take a look. Inside, I was pleasantly surprised to see that it was only the purple (live) connection that had come off. How easy was that? I had a look at how all the switches intertwine with the steering lock and why my indicators don't reset when turning right. 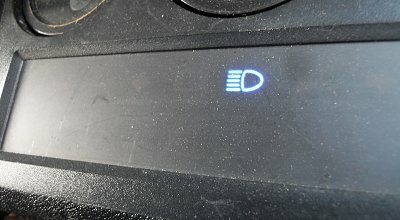 Were there other problems with the headlights switch, then I would turn my attention to the area labelled B where actual contact is made to put the headlights to full beam. The stalk (A) moves towards the steering wheel, the corresponding connection at B moves the same way, and vice versa when pushing the stalk away. Whether the stalk 'clicks' in or springs back is due to the shaping of the yellow plastic bit, which has various teeth dictating where the spring loaded stalk sits. My plastic bits are a bit worn, so that's why the steering column doesn't reset the indicator when turning back from right. The part number for this item is STC439, but with prices ranging from £20 to £130 I think i'll just live with it. Besides, i'm dead chuffed that I now have flashing headlights.